New from Latin Percussion. A stylish backpack full of musical fun! 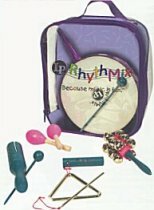 Includes hand drum with mallet, jingle stick, triangle, tone block with mallet, a pair of Chik-itas and a clear vinyl backpack with musical activity booklet. Ages 3+. To see more items like this explore our Rhythm Set Dept. Click here These are safety-tested and age graded products. All RhythMix items are ASTM and CE approved.